Heat oil in a pan and fry onion till it turns golden colour now add ginger garlic paste and cook for 2 minutes. Add potatoes,salt,red chilli powder,turmeric powder,coriander powder,cumin powder,mango powder and tomatoes and cook it very well. Pour a 1/2 cup of water so that potatoes can be tender, when gravy turns thick and oil seprates then add capsicums and give a steam for 5 minutes. Now add garam masala powder and stire it well lid with a cover for 2-3 minutes. Sprinkle chopped green coriander and squeeze a lemon. 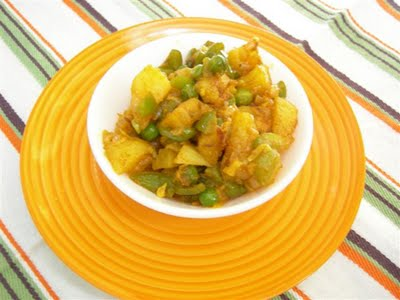 Turn it out in a dish and serve with chapatis or puris.